Welcome to Alihi Lani #3 at Poipu Beach. As you enter the door you are immediately drawn to the splendor of the Pacific Ocean directly in front of you. New Air Conditioning units installed in the bedrooms can provide cooling throughout the open setting, although the prevailing ocean trade-winds supply natural air flow. As many of our guests mention in their reviews, "The pictures don't do it justice, the view is spectacular!" Our premier ocean front condo has been completely upgraded with classic Hawaiian decor, including new living room furniture. Stroll on the cool natural stone floor throughout, enjoy the upgraded cherry cabinets, granite counters and stainless appliances in the brand new kitchen, or relax watching your favorite sports or movies on 3 flat screen TVs. HDTV cable service is provided, including a wide variety of music channels. Most of all, enjoy our new lanai furniture while you unwind on the covered Lanai and admire the ocean waves breaking over the coral, or the surfers trying to catch the next wave, and finally the sun-setting over the water during the winter months. Have you ever seen the 'green flash'? This unit is 'the prime location' on the ground floor within this 6 unit complex, close to the pool and BBQ grill area. Relax and unwind on the lanai for 'happy hour' and enjoy our newly refinished pool overlooking the Pacific Ocean. Private parking is located in the rear of the building, allowing direct entry, no stair climbing to the 2nd floor. The living and dining area has been upgraded with new furniture, including a 60" flat screen HDTV, along with an HD/DVD, DVD movies, CD player and several paperback books. Our new sofa has a hide-a-bed with a plush 7" mattress for guest comfort. The new Kitchen is fully equipped and upgraded with stainless appliances, including the Refrigerator, Dishwasher, Range and Microwave. New Cherry cabinets and beautiful granite counter tops finish off this convenient area to gather and make your meals. The Master Bedroom includes a fantastic California King sized bed, along with a 32" wall mounted flat screen TV. The adjoining bathroom has also been tastefully upgraded with a new vanity, mirror and stone shower surrounding the bath tub. The Guest Bedroom includes two twin beds that can be combined to make into a Queen sized bed if desired, and a small flat screen TV. The second bathroom is right around the corner from this room, and includes a newly vanity, mirror and upgraded stone shower. Initial supplies of local island soap, shampoo and conditioner, along with Kauai coffee and cookies, are provided to make your first morning on the island special. All of your towels and linens are provided, along with a full size washer and dryer for your use. Laundry detergent is provided. Relax in the sun at our private pool, cook your meals on our 2 new Weber BBQ gas grills, or take a short walk to the sandy beaches. The nearest beach is located 2 blocks east of us in front of the Sheraton Hotel. Hawaiian state law declares all beaches are public for everyone to enjoy. Beach chairs, Boogie Boards, towels, mats, an umbrella and a portable cooler are available for your use. Stock up at the Costco in Lihue and get ready to relax in our prime location on the south shore of Kauai. The small village of Koloa is within a mile and has a Big Save grocery store which will meet most of your food and beverage needs. Our property is fully licensed with the State of Hawaii to collect General Excise Tax (GE-123-225-7024-01) and Transient Accommodations Tax (TA-123-225-7024-01). We welcome your rental inquiries and promise to make your rental experience memorable. Our first visit to Kauai in 2004 made a lasting impression and resulted in our purchase of this property the following year. Our desire is to provide an upscale home away from home for visitors tired of the hotel experience. Small 6 unit condo complex provides private setting for families to enjoy. 3 flat screen TVs, movie library, beach chairs, boogie boards, rolling cooler. What a lovely place to relax and escape the winter weather from back home! We really enjoyed the Poipu Beach area and the wide variety of restaurants and shopping available. The condo was perfect for our family and the pool steps away. We enjoyed the grill and sunset most evenings and the new friends from next door. A beautfiul well appointed condo with stunning views and an excellent convenient location! We loved this condo! It was clean, well organized, beautifully decorated and had a fabulous kitchen stocked with all you need to make and serve a great meal! The view from the condo is amazing with a new sunset to appreciate everyday. We all loved the pool and the short walk to the beach. The closet was full of every beach item you can use! We can hardly wait to return! Ron's communication with me was amazing from the beginning answering any questions I had quickly and giving us all the information we needed to make our trip seamless. Thank you Ron! Wonderful setting with a great view! Our family found this property perfect for our stay, fully equipped with everything we needed. The surrounding Poipu Beach area is laid back and a great place to relax and recharge. We are already talking about when we want to come back. The owner is very helpful and made our reservation process quick and easy. Mahalo!!! Five out of five stars for this perfectly located condo. The condo has all the amenities necessary; AC in the bedrooms, full functioning kitchen, televisions, washer/dryer and outdoor patio with pool just steps away from back patio. Our host Ron was excellent and and responded in a timely manner to all of our questions and concerns. Spectacular view of the ocean and amazing pool. Highly recommend. 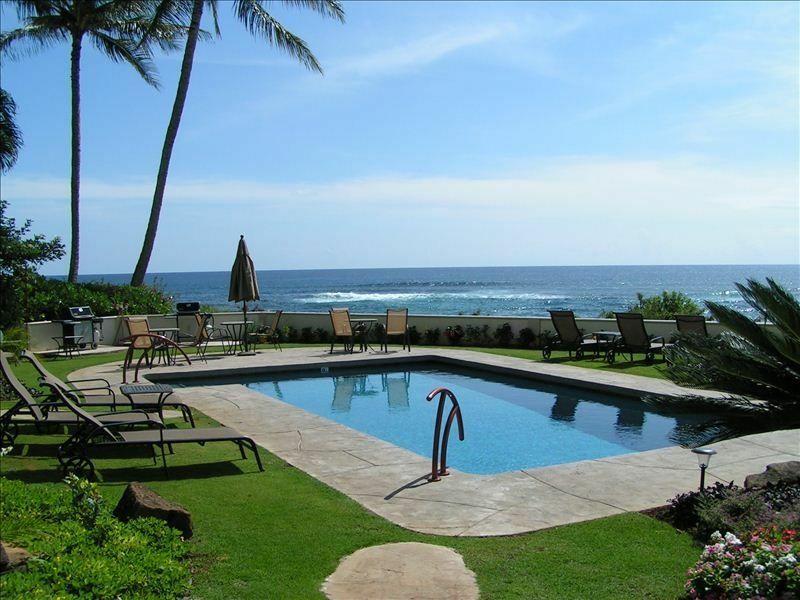 Great location with all the amenities you need for a wonderful Kauai vacation! What an amazing location with an incredible view. The condo made us feel like we were at home with everything we could ask for. The sunsets each evening we’re spectacular and the setting very peaceful. Highly recommend this property and we will return. Approximately 20 miles west of the Lihue Airport. 1 mile south of the village of Koloa, which includes several churches, groceries, restaurants and a bank/ATM. The Poipu Beach area includes several hotels, restaurants and two interesting shopping areas. Other Activities: Wildlife viewing, boating, shopping, golfing, kayaking, snorkeling. Golf: Kiahuna Golf Course is less than 1 mile, and the Poipu Bay Golf Course is about a mile and one half to the east. This was the former site of the PGA Grand Slam of Golf and is a very challenging course along the south shore of Kauai.